This part of the “Guide to TYPO3 Documentation” is about the content and the question where you find which information. 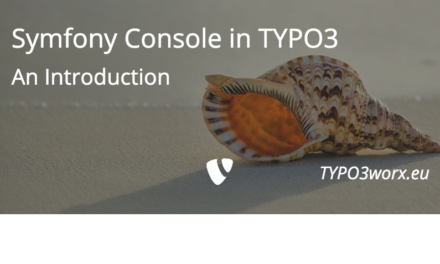 In this post I will describe the structure and topics of the main sources of TYPO3 documentation. “Community Writings” is a section in the state of “Work in Progress”, where some sources outside of docs.typo3.org are linked. The News section lists all major changes and updates in the last years. The number of news of the year 2016 reflect the fast evolution. As you can expect, the main and central part is the section “TYPO3 Documentation”. Martin Bless announced the year 2017 as “THE year of documentation”. So we can expect a lot, especially if we support him through contributions. (“How to contribute” will be the topic of the third part of this series). This section contains the official TYPO3 documentation with its various types. The following chapters describe which types of documentation exist and what topics are covered for which audience. References (https://docs.typo3.org/typo3cms/References/Index.html) provide very detailed and structured information about a specific topic. Guides (https://docs.typo3.org/typo3cms/Guides/Index.html) are designed to familiarize a reader with a specific topic in order to provide a working knowledge of a particular process. Tutorials (https://docs.typo3.org/typo3cms/Tutorials/Index.html) are designed to be step-by-step instructions specifically created to walk a beginner through a particular topic from beginning to end. The section “Cheatsheats” (https://docs.typo3.org/typo3cms/CheatSheets/Index.html) contains a collection of such found around in the net. There is a tutorial for editors. The current version covers TYPO3 7LTS. If you are using another TYPO3 version, this document is also worth a look, because you will recognize most parts in other versions quite quickly. If you not only want to edit content within TYPO3, but also want to run a website using TYPO3 by yourself, you should take a look at the next chapter. If you are on building your first site with TYPO3, you should follow the “Getting Started Tutorial“. It covers the installation process and introduces the main parts of the TYPO3 backend. After completing it, modifying the TYPO3 configuration becomes interesting. This is done with TypoScript, some kind of configuration language. Even if the name suggests it, this is no scripting language, but a syntax to define the configuration of a website. All the bells and whistles about TypoScript can be found in the TypoScript Reference. It covers all details with short examples about TypoScript. TSconfig is also “TypoScript”. It uses the same syntax and share some common functions. “TypoScript” is solely responsible for the configuration of the frontend, where as “TSconfig” is there to configure the backend. Even if the customer focuses mostly on the frontend output, in each project you should also focus on the editor experience. You can achieve a high editor satisfaction (and a lower amount of support), if you configure the backend wisely. The current documentation for the templating engine Fluid is some kind of “hidden” in “Extbase and Fluid Guide“. The overview page labels it as “WIP” (Work in Progress). Besides that I did not find an official reference or something like that. In my opinion the templating and fluid documentation needs a lot more love. If you are interested in, stay tuned for the third part of the series: “How to contribute documentation”. But now let’s have al look the the documentation for “backend” and php developers. The big picture of TYPO3 is explained in “Inside TYPO3 CMS“. Terms like for example “Backend”, “Frontend” or “Extensions” are explained. Furthermore an in depth look is taken on the topic, how they play together with each other and the basic infrastructure like webserver, database and php. The TYPO3 Core API Reference on docs.typo3.org contains the official documentation for developing TYPO3 extensions. It explains all areas, you need to know in detail for successful extension development. If you still need more detailed knowledge, you can head over to api.typo3.org. This site contains all documentation, which is automatically generated via Doxygen from the source code. TYPO3 versions from TYPO3 4.5 on (except TYPO3 4.6) are covered by this website. “TCA” stands for “Table Configuration Array”. It is included in (nearly) every extension, as this describes how database and rows are displayed in the backend. The TCA reference is very detailed and up to date. Very helpful are the various examples throughout the reference. Yes, you are reading right … “ChangeLog”. The TYPO3 ChangeLog documents all new features, deprecations and breaking changes. Each topic is explained with a description and how to use it, or, if a function is deprecated, how the new way is. The ChangeLog in this format was introduces with TYPO3 V7 and is also available for version 8. TYPO3 services are service function provided by the core, which can be used by other extensions too. A good example is the AuthenticationService. The core provides its own authentication, but you can easily add your own service, like ldap. The File Abstraction Layer is there since TYPO3 6.0, but the documenation did not grow much over time and is still marked as “WIP”. TYPO3 Extensions are a “special case”, which I can not add to one or the other category. Extension documentation contains mostly editor and integrator documentation. But some extensions are easily extendable by developers. If an extension provides documentation, it is rendered at least once a day on docs.typo3.org. There is a search over the extension keys, which are available on the server. If you do not know the extension key, you can also access it via the extension repository: https://typo3.org/extensions/repository/. There is much documentation about TYPO3 around. It is getting better and better especially through the efforts by Martin Bless. But documentation, not only code, needs love. Size and quality depends how much time and energy community members invest here. So the next part of this series will be about how you can contribute to TYPO3 documentation. Just a small tipp at the end: Even if you do not need the documentation right now, I can recommend to read it as some kind of book. There is no need to go too much into details and to follow each example, but it will give you an impression, of what is possible … and probably you will remember the one or the other thing, when you are going to need it. At least you will remember, where to search. I found the blog post image on pixabay . It was published by Steve Buissinne under the CC0 public domain license. It was modified by myself using pablo on buffer. Thanks for the overview. I’ve just discovered some hidden gems! “Community Writings” no longer exists. You may find something similar in “Tell me Something About”. The old marker based template and css_styled_content tutorial has been replaced by the “Sitepackage Tutorial” written by Michael Schams (https://docs.typo3.org/typo3cms/SitePackageTutorial/) and the template tutorial has been updated in “latest” by Andrew Murphy (https://docs.typo3.org/typo3cms/TemplatingTutorial/). The older versions still contain the marker based way, which is now outdated and no longer encouraged.